For over 100 years Camp Jewell YMCA has been a pioneer in off-camp adventure trips. Our trips offer teens new challenges through activities like kayaking, rock climbing, hiking, and biking. They are led by specifically trained staff that are over 21 years of age who are selected for their leadership experience, certifications, and love of the outdoors. Campers will have an opportunity to get to know themselves and each other better, as well as build strong relationships within their adventure trip group. A road trip across New Jersey, Pennsylvania, Washington DC, Virginia to visit unforgettable amusement parks, national parks and cultural attractions along the way. 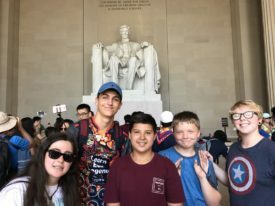 Trip includes visits to Six Flags, Hershey Park, Gettsyburg, the Smithsonian and so much more! Fun in the Sun will be an amazing experience for all! We’ll be flying down to Florida for a whole new version of Parks and Rec. Campers will visit Universal Studios, Kennedy Space Center, Gatorland and more! Our most popular trip––this two-week adventure trip will venture out on bicycles to the Islands of Martha’s Vineyard and Nantucket. Along the way they will visit the beach, stay in youth hostels, go on a whale watch, sea kayak, and eat lobster flavored ice cream.